Be the first to share your favorite memory, photo or story of Odie. This memorial page is dedicated for family, friends and future generations to celebrate the life of their loved one. Odie Irene Henderson passed away at her home in Petal, surrounded by her family, on November 19, 2018. Mrs. Henderson was born on April 18, 1931, in Jeff Davis County, MS. She graduated from Bassfield High School, and was named Miss Bassfield of 1944. 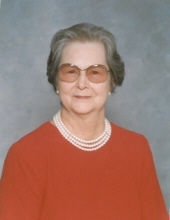 She attended the Methodist Hospital School of Nursing, and worked as a nurse until she retired. She was married to A.L. Henderson, Jr. for sixty-five years. Mrs. Henderson was a member of Carterville Baptist Church, and enjoyed traveling with the Keenagers. She was devoted to her family and friends, and delighted in hosting parties at her home. Mrs. Henderson was preceded in death by her husband, A.L. Henderson, Jr.; her parents, Leon and Avie White, and one brother, Doyle White. She is survived by two daughters, Debbie Sullivan and Donna Wright; one brother, Ralph (Marybeth) White; one sister, Brenda (Jay) Wells; two granddaughters, Kristi Noll and Lisa King; four great-grandchildren, Shaffer Carter, Shelbey Carter, Lauren (Ragan) Grant, and Blake King; two great-great-grandchildren, Kendall Hilton and Mia King; two nieces, Marjorie (Matt) White and Susan (Barry) Wass; one nephew, Chad (Holly) Wells. Visitation will be Saturday, November 24, 2018 from 9:30 a.m. until the service at 11:30 a.m. at Moore Funeral Home in Petal followed by burial in Hillcrest Cemetery. The family would like to thank the staff and volunteers of Forrest General Hospital Hospice, and especially Katie Peoples and Mary Moss, for the kind and professional care given to Mrs. Henderson and the moral support given to the family. To send flowers or a remembrance gift to the family of Odie Irene Henderson, please visit our Tribute Store. "Email Address" would like to share the life celebration of Odie Irene Henderson. Click on the "link" to go to share a favorite memory or leave a condolence message for the family.